Edmonton Oilers general manager Craig MacTavish gripped his iPad in his hands with his palms sweating as deputy commissioner Bill Daly opened 11 envelopes without finding a winner for the NHL draft lottery. When Daly pulled out the gold card with the oil drop logo on it, MacTavish knew picking first was a "game-changer" for the franchise. The Oilers now have the opportunity to select Connor McDavid at the draft this June. "There's been a lot of pain and suffering, for sure, for Oiler fans, but this is a real special moment for all our fans that have supported us," MacTavish said on a conference call Saturday night. "It's been some pretty lean times over the last number of years, but this is going to go a long way to ending those." As expected, MacTavish said there was "zero" chance of trading the first overall pick. The Buffalo Sabres, who finished last, are expected to choose American centre Jack Eichel second overall. This is the fourth lottery win in six years for the Oilers, who selected Taylor Hall in 2010, Nail Yakupov in 2011 and Ryan Nugent-Hopkins in 2012. Hall and Nugent-Hopkins are stars, but McDavid is considered a once-in-a-generation talent like Sidney Crosby and Oilers great Wayne Gretzky. While MacTavish was watching from Switzerland, where he's scouting the under-18 world championships, McDavid was in Toronto where the lottery took place. The 18-year-old Erie Otters centre controls the play on the ice, but he had no control of his future, which was determined by pingpong balls. "That minute where they're picking out the cards, I think that was the fastest my heart's ever beaten," McDavid said. "This thing only happens once in your life. It was fun and exciting and it certainly got my heart beating. It all worked out." It all worked out for the Oilers, who haven't made the playoffs since reaching the Stanley Cup final in 2006. Edmonton had an 11.5 per cent chance of landing the top pick after finishing 28th out of 30 teams. The Oilers' most glaring need was a centre to play big minutes with Nugent-Hopkins. McDavid fills that void. McDavid finished third in Ontario Hockey League scoring with 120 points, including 44 goals and 76 assists, despite playing just 47 games. "A very dynamic player, open-ice game," MacTavish said of McDavid. "He's not only the most productive junior player but also the most dynamic." Even though the Oilers didn't announce McDavid as the pick, assistant GM Bill Scott said the moment on stage June 26 in Sunrise, Fla., is important. Hall wasted little time welcoming his future teammate tweeting: "Hey @cmcdavid97 left shot black tape left side" at the player who could be his centre for years to come. "I think they have a great young group of talent there," McDavid said. "Obviously names like Hall and Eberle and Nugent-Hopkins and Yakupov and the whole deal, Schultz. They have such a good group there." McDavid's arrival coincides with the construction of a brand-new downtown arena in Edmonton. Scott agreed with the notion that it's a "perfect storm" to have this much young talent coming as Rogers Place is set to open in the fall of 2016. "It sure turns the focus squarely on the Oilers as a team to be reckoned with in the future," MacTavish said. "I think offence wins hockey games and we're going to be loaded with it. This is another piece along to that end. It's so important for our franchise on so many fronts." After the Oilers and Sabres, the Arizona Coyotes will pick third, the Toronto Maple Leafs fourth and Carolina Hurricanes fifth. 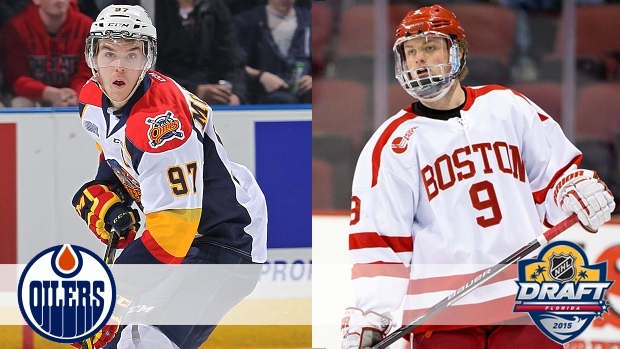 Following McDavid and Eichel are top prospects like defenceman Noah Hanifin and centre Dylan Strome. McDavid, Eichel, Hanifin and Strome were all careful to say that a lot can happen before the draft, but for the first time since Steven Stamkos to the Tampa Bay Lightning in 2008 it's a slam dunk who's going first. "That would obviously be an absolute dream come true," McDavid said. "(The Oilers have) got fan support even through the bit of a tough slide I guess they've gone through in a couple of the years. The fan support they still receive is amazing."